It's no secret that we do have a bit of a passion for meat pies here at Pierate, but in the interests of our vegetarian friends we do occasionally try out vegetarian pies. Hence, here is a vegetable pie from Tesco. About this time last year, my comrade SJL trialled a Tesco Chicken and Vegetable pie, and found it not to be to his satisfaction. His title "An Unfulfilling Situation" says it all really. I want to see if Tesco have improved on their value pie range. Above, you can see the puff pastry has crisped nicely, and the pie is a nice golden brown colour. However, this pie is very small. The plate may look very large, but I can assure you that's a normal sized plate. The pie really is just that tiny. Upon opening the pie, I note that there is a distinct lack of filling. 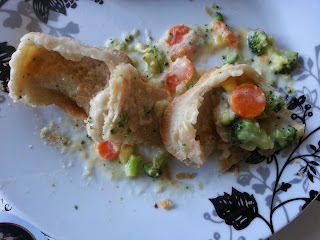 As you can see from the picture above, the filling consists of almost exclusively carrot and broccoli, which appears to have gone mushy and fallen apart in the frothy white gravy. What's more, the quality of the vegetables looked very poor to me, and suspiciously not too dissimilar from what might come out of a value pack of frozen vegetables. The pastry was alright - very light and thin - but very standard. I thought this pie was utterly pointless. At least it was cheap. 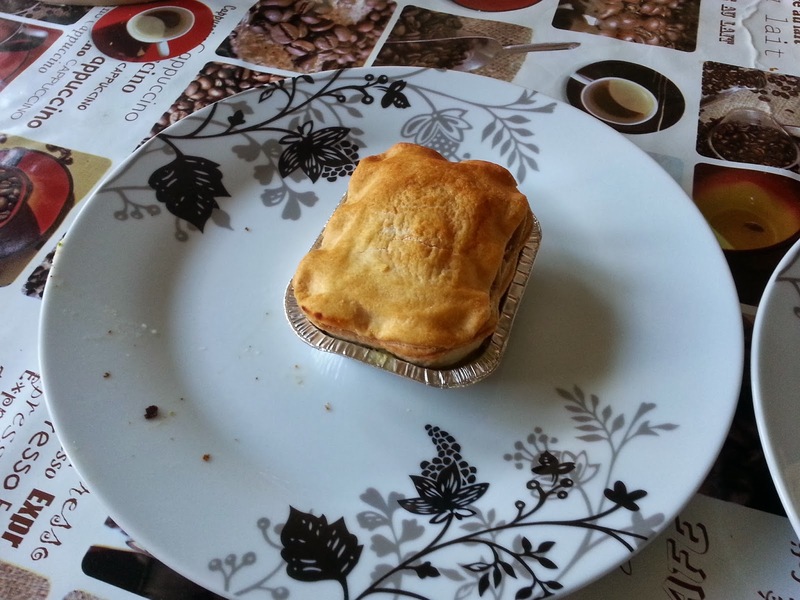 To me, the filling was frothy and unsubstantial - and hence this pie deserves an unsubstantial score.